Dolphin Valentines Gifts - Click on an item for more details! This stunning dolphin ring is made of the finest sterling silver with Created Opal. Makes a great gift item for dolphin lovers in your family, friends, loved ones, or even yourself. Velvet pouch and Gift Box Included!!! ***Size 7*** Color may vary slightly. Available in a variety of sizes. This gorgeous dolphin ring is made of the finest sterling silver with Created Opal. Makes a great gift item for dolphin lovers in your family, friends, loved ones, or even yourself. Velvet pouch and Gift Box Included!!! ***Size 6*** Color may vary slightly. Also available in a variety of sizes. 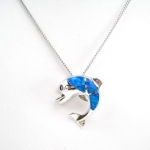 This gorgeous Dolphin Pendant is made of Sterling Silver with Inlaid Created Opal and CZ Tanzanite. The pendant measures approximately 1" across and 1" in height. 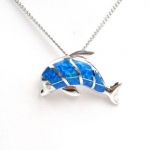 The pendant has a loop to place the pendant charm on any chain, a perfect gift for the dolphin lover. Chain not included! 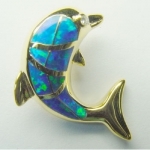 This gorgeous Dolphin Pendant is made of Created Opal, CZ Tanzanite and 14kt Gold over Sterling Silver. The pendant measure approximately 1 inch wide, 1 inch tall. Makes a great gift item for your family, friends, loved ones, or even yourself. Velvet pouch and Gift Box Included! Color may vary slightly. 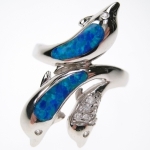 This beautiful Dolphin Lover Family Ring is made of the finest sterling silver with Created Opal. 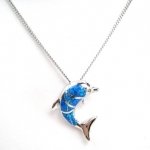 Makes a great gift item for dolphin lovers in your family, friends, loved ones, or even yourself. Velvet pouch and Gift Box Included! ***Size 5*** Color may vary slightly. Also available in other sizes.